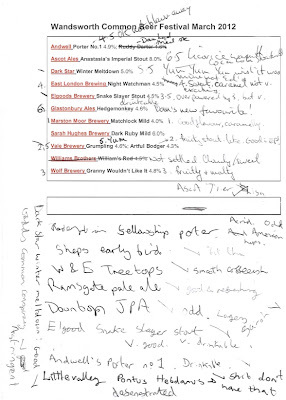 Everything will pass, and the world will perish but the Farnham Beer Exhibition will remain. Farnham Beerex rolled round again and much to my surprise some of my beers were on this time. Not sure how they got there, but a wholesaler must have been involved as I didn't deliver them. The tokens system was even more irritating this year, with a strip now costing a fiver and each token worth 20p. The beer selection was good and it's one of my favourite festivals so I should really stop whinging but hey, I'm on a roll. So I will mention that there was a shockingly inaccurate article on Farnham hops in the programme that made me place my fist, which is rather smaller in size than a common loaf, in the mathematical centre of the maltings's little table, and with it give a bump or two thereon. Oh yes. 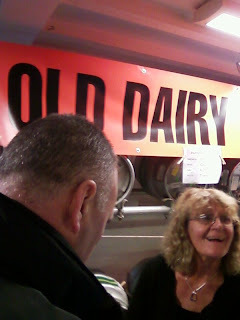 Back to the beers though, aside from the delights of my own, Mighty Oak was on form, and Summer Wine Teleporter got the thumbs up. The wooden spoon sadly goes to Sarah Hughes, as the normally excellent Dark Ruby Mild wasn't up to scratch and the Pale Amber was decidedly dull. Get them a Randall Jr. They could probably even add enough hops to make craft beer out of non-craft beer (is that the right term? Or normal beer or ordinary beer or whatever.) I can't help but think it would be flat though. 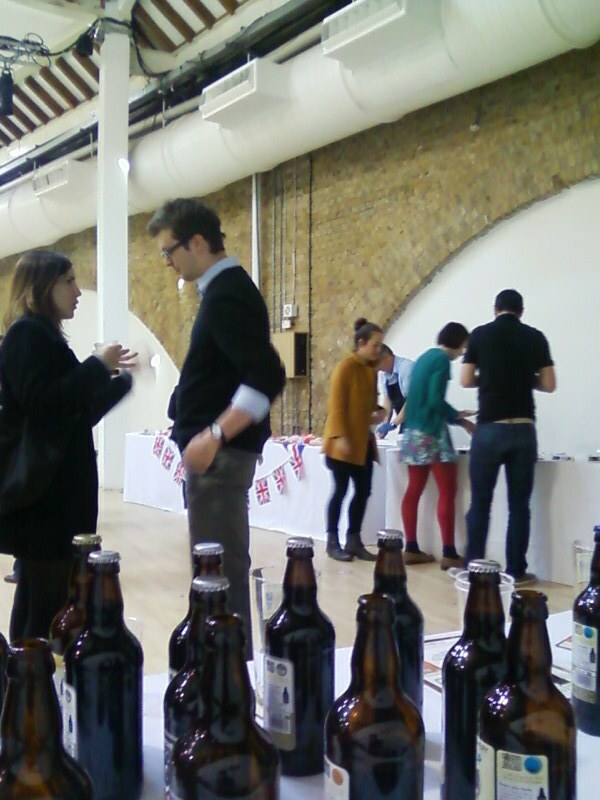 On Saturday whilst I should have been catching up with my beauty sleep I was hot footing it to Borough to tout my wares at Sainsbury's Great British Beer Hunt. I don't know many brewers entered the competition but only eight or nine companies turned up at the promotional event. 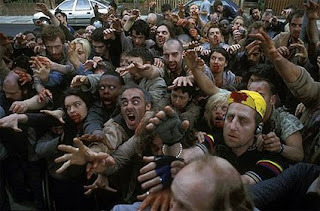 I was a little apprehensive as I'd heard there were going to be 200 punters for the tasting and I was expecting something like when the wrong door gets opened in a zombie film and a shambling mob lurches in. 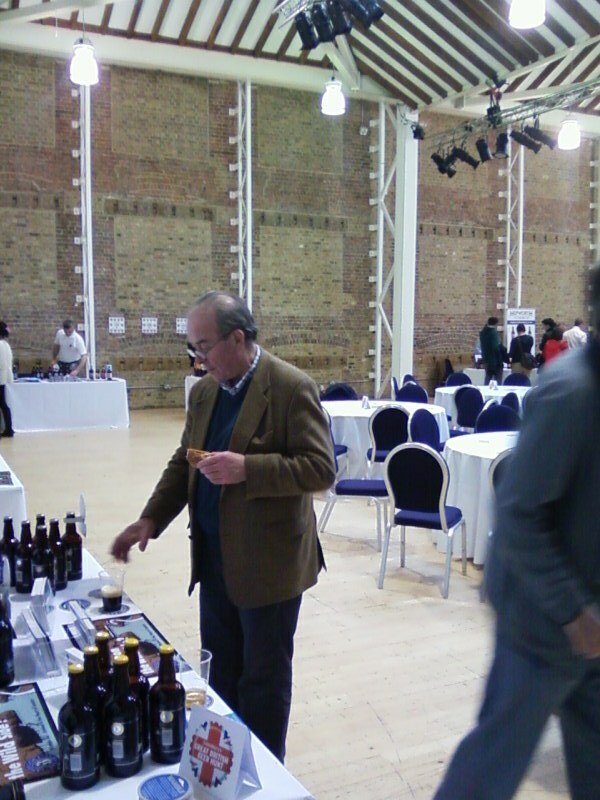 In fact the tasting for the competition was done in a separate room the tasters arrived in staggered groups. 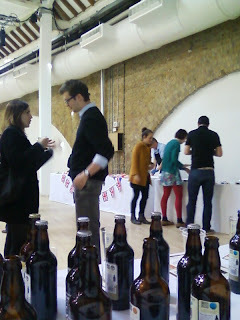 As well as the public there were also serious beer bods there which was an added bonus. I got to shake hands with Michael Hardman, one of the four apostles. I would say I'll never wash my hand again, but that would be an empty gesture as I haven't washed it for many years already after shaking hands with Dave Brock. I also got to meet one of my beer heroes, Glenn Payne, who was once the beer buyer for Safeways supermarket. It's thanks to him that I learnt about the delights of American craft beer many years ago, when I could buy beers from the likes of Goose Island and Dogfish Head in one of my local supermarkets. I don't know quite how Sainsburys decided which nectar card holders to invite but the number of youths and the balance of the sexes was promising for the future of beer. I enjoyed talking to so many beer enthusiasts but it was a long day and I can't say I was sad when it was time to go home, and more importantly get to the pub. Thanks to the Lovely Lisa. I added a scientific approach to my drinking researches this weekend. 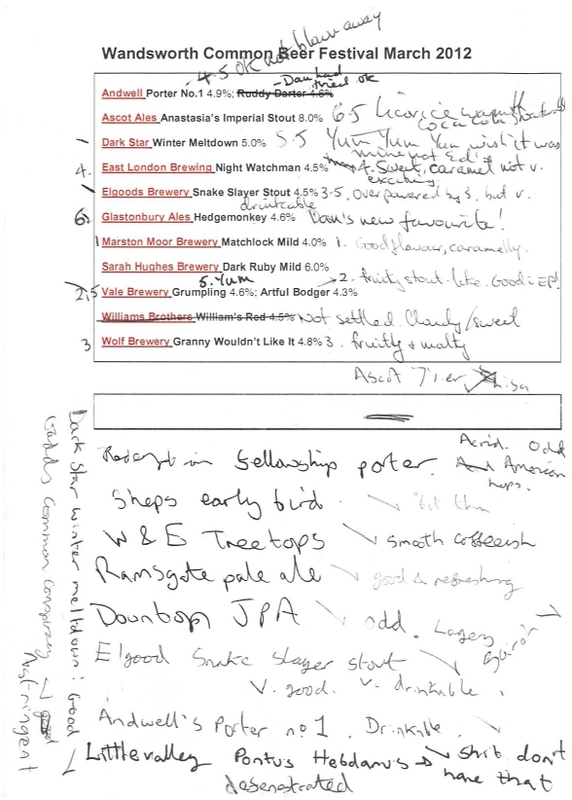 When ticking pubs in the good book I've now got a rigorous scientific system, thanks to my mate Jim (a Surrey compleatist). Would you make it your local? This gives pubs an objective scientific score and removes the subjectivity that might otherwise creep in when rating pubs. Does it have a beer garden? We were down Brighton way and after a health walk on the downs had some refreshment at The Greyhound in Keymer. This was a great pub, only a couple of beers on though so I had a pint of Harvey's Best. Having seen how much places like this charge for scotch eggs (five bloody quid each!) we'd taken the precaution of eating some from Sainsbury's (85p for two) before getting there. 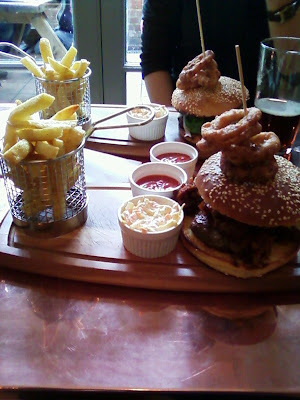 Burger and chips was at the more normal pub meal rate of a tenner so we stopped for food, which was good but irritating. Yes, very pretty but could I have a plate please? Next it was on to The Pump House. Beer quality was not so good, but they did have a proper weirdo at the bar so it scored there. After that we headed back to where we were staying, The Jack and Jill in Clayton. Sadly I can't rate it as by 9.30 pm they'd stopped serving food and shut. An inevitable consequence of pubs turning into restaurants I fear. Well, either that or they're a bunch of inbreds. Working as a brewer in a hop growing area has its advantages. A local retired hop farmer has taken to cultivating in small quantities a promising looking wild hop he found, and he's let us have some. Because hops are normally grown from cuttings all new hops grown from seed are new varieties. As the farm is just over the border at Northiam this hop has been called The Sussex Hop. We made a single hop beer with shed loads of the hop. It's got an interesting fruity flavour, with hints of citrus and vanilla. 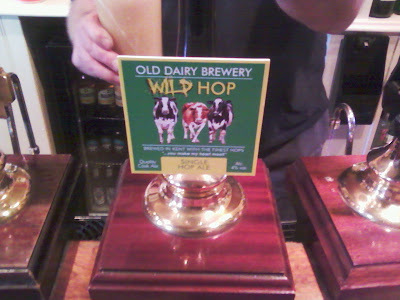 Being in Kent we didn't use the word Sussex in the beer name, deciding to call it Wild Hop. The last firkin will be on sale at the Egham Beer festival this week, so all the more reason to go. I myself have taken the precaution of already having some at The Crown, but fear not if you can't make Egham, there will be more made. Craft or Keg? Is it Real? Having just returned from a beer tour of the West Coast of America, I can report on the flourishing ale revolution in California. Although they would, themselves, say that the beer revolution is more of a revival as the beer scene is merely returning to the volumes per-Prohibition. It's easy to forget the US beer industry was wiped out by Prohibition and never fully recovered. The so-called craft revolution of the last 10 years reflects a growing interest in "Craft" ales here in the UK. But what exactly is craft, is it real? The founders of CAMRA fought a hard battle from 1974 to eradicate keg and promote traditional cask conditioned beer in Britain. I feel strongly that having won the battle we are now beginning to lose the war. For CRAFT read KEG. The ingredients may be top notch and the process refined with superb state of the art brewing equipment and technique but essentially Craft Beers are carbonated, pasteurised and served under blanket pressure. Everything we have fought over the last 40 years to eradicate. Make no mistake these so-called Craft Beers can be very tasty. But the problem often lies in the underlying "freshness" of the barrel on dispense. Cask conditioned ales notoriously have a very short shelf life. But these craft, or as I prefer to call them, keg beers, can last 3 months on a continuously sliding quality scale without ever actually turning to vinegar. You can tell a tired keg ale instantly. The slight haze due to the gradual absorption of the CO2 into the beer and worst of all, the metallic taste of stale beer. Keg beer makes good sense for brewers and good sense for retailers as the improved shelf life means less, or no waste. 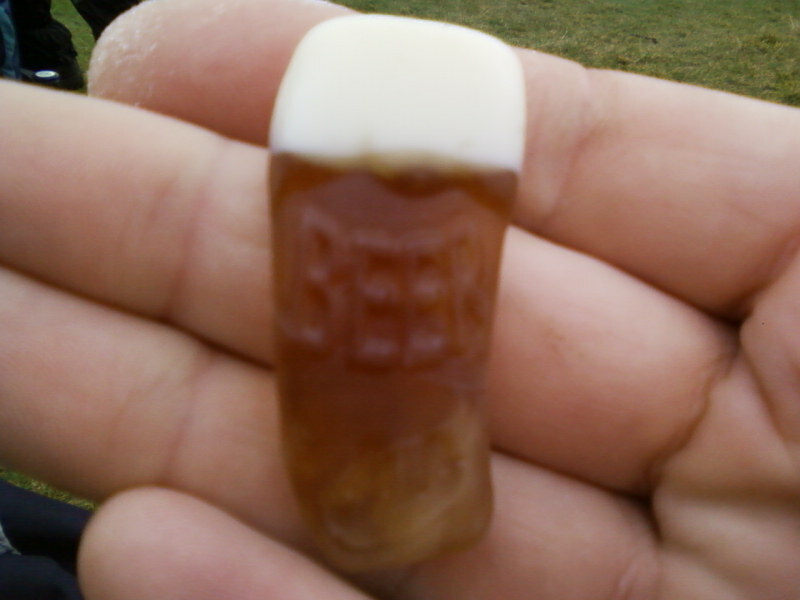 But be award, its not real ale, and never will be.